Finca dels Horts is a pretty and well-equipped holiday villa situated in a peaceful rural location in the foothills of the Tramuntana mountains. The villa is conveniently located close to the town of Inca and the main road across the island, yet it is in a very quiet area surrounded by almond. The house, sits on a large plot with terrace, lawns and of course a swimming pool. It is stone-faced in the traditional style with wooden shutters at the windows, all on one level, and the generous sleeping accommodation makes it ideal for two families with children. Inside the house there is an open-plan area with a fully-equipped kitchen, dining room and a lounge with satellite television. 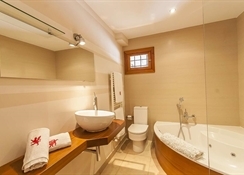 There are two double bedrooms with en-suite bathroom and hydromassage bath, plus a large bedroom with three sets of bunk beds and a bathroom with shower. All rooms have central heating and air-conditioning. The large outside space means that visitors can enjoy themselves just lounging in the garden by the pool, yet the central position of Finca dels Horts also means that it is very convenient for visiting all parts of the island, the Tramuntana mountains, the beaches and the city of Palma itself.